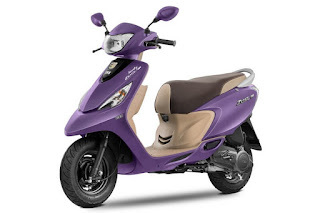 TVS Motor Company has presented another Matte Purple shading plan to its famous Scooty Zest 110 bike. Strangely, the cost of the new TVS Scooty Zest 110 Matte Purple is like the other matte shading models – i.e. Rs 49,211 (ex-showroom, Delhi). The new shading variation was displayed at the as of late closed Auto Expo 2018. Presently, the bike's Matte Series is accessible in a sum of five shades – the new Matte Purple, Matte Black, Matte Blue, Matte Red and Matte Yellow. In the 100cc bike space, the TVS Scooty Zest goes up against Honda Activa I, Suzuki Let's, Hero Pleasure and Yamaha Ray-Z. Conveying a kerb weight of 97kg, the TVS Zest sources its preventing power from a 110mm front and a 130mm back drum brake. The bike rides on 10-inch wheels fitted with 90-area tubeless tires. It has a fuel tank limit of 5-liters.